When Kevin Durant first went down with an injury in the preseason, onlookers of all types gazed upon the Oklahoma City Thunder with pronounced and robust wonder. How would top dog Russell Westbrook fare without the NBA’s reigning Most Valuable Player? How would a freed Westbrook act in accordance with Scott Brooks’ scripture? And, perhaps most importantly, what would a Westbrook-centric Thunder look like? Forget, even for just a minute, that he is the leading scorer in the NBA, or that his usage rate is set to land in second place at its current mark of 38.4 (Who’s #1? The version of Kobe Bryant that scored 81 points on a sad-sack Raptors team in the middle of January 2006, of course). Since the calendar flipped to 2015, no basketball player has been better than Russell Westbrook. Through Sunday’s game against Chicago, Westbrook is averaging 27.5 points, 9 assists and 8.2 rebounds per game in the New Year. All eight of his triple-doubles thus far this season have come since January 1st, including an absurd run of six in the last nine games. Kevin Durant hasn’t played since February 19th against Dallas (a game from which, it ought to be noted, the Thunder emerged victorious). Durant’s injury is the lightning required to shock Westbrook into the fifth dimension, one he shares with the likes of Oscar Robertson, Wilt Chamberlain and Magic Johnson. As the sole alpha dog in Oklahoma City, Westbrook seems to carry the basketball as if he were the sole recipient of fire, and his mission was to introduce it to the rest of the unworthy human race. His sense of self-protection, never the most paramount of concerns, seems to have diminished without Durant around to remind him that, hey, Russell, we’re playing basketball, there’s no need to get yourself killed trying to dunk through the ceiling for a Vine. 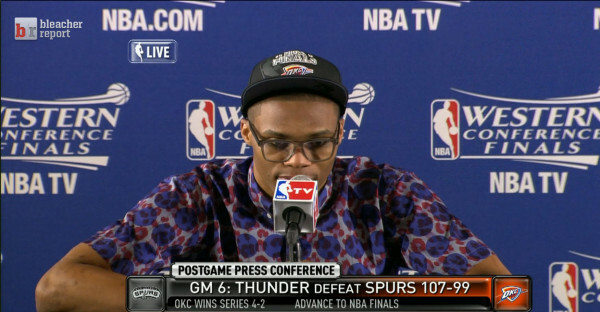 Not that Vines are among Russell Westbrook’s main foci either. His total disregard for anything or anyone other than what he needs to do at any given time calls to mind John Wayne just as much as it does J.R. Smith. And the thing is, even the Duke had an off day every so often. Night after night, Westbrook sends NBA Twitter into a frenzy, though no combination of words (even especially this one!) is truly adequate to do his random acts of basketball justice, let alone a paltry 140 characters with a picture or gif. His current pace is almost single-handedly what’s carrying all of us, the viewers, from the All-Star Break through the playoffs, tight Eastern Conference fringe races notwithstanding. Russell Westbrook has become the embodiment of appointment viewing for the regular season NBA. You know appointment viewing, that institution of the American Dream which gathers families around a television for a special evening together? It dies every few years due to some progress in technology or a perceived sense of ennui from those darn youths. But even technology cannot slow down Russell Westbrook. He’s the kind of general that doesn’t care if you’re following him into battle, so you’d better follow or get as far out of the way of that impending nuclear reaction as you possibly can. That means you, Dion Waiters. It’s not that he’s selfish; his aforementioned run of triple-doubles could’ve told you that, but for you Morey-types, he ranks fourth in the league in assists per game and leads overall in assist percentage. It’s really more that he has a preternatural and innate sense of self-belief, a confidence which does not betray arrogance simply because it seems that everything he does is entirely necessary to furthering the cause of his team. Grab a rebound, run the floor and throw down a dunk without passing to anyone else? Sure. Take on every opposing defender, Kobe-style, in some warped basketball death match? Absolutely. Charge into a pit of fire and emerge with a fresh block of ice? Have the Gatorade coolers open, Coach Brooks. When Durant returns, which should happen in the next week or two, he will unwittingly and unwillingly carry the same misguided doubts about “fit” and “style” which inevitably befall Oklahoma City’s heroes when they play together. It’s easy to cast Durant as Apollo and Westbrook as Dionysus, each with a complementary burden of the world on his shoulders. Perhaps the best for which we can hope is not that Westbrook’s chaos reels itself in and becomes more controlled; it already has, and the people who look at Westbrook as a fire-breathing antagonist of team basketball and “the good of the game” are the same people who used to think (or still do think) that Blake Griffin is solely good for Kia-branded dunks. No, what we should want is presumably what the players themselves want, an understanding of their synergy to be bestowed upon detractors so that they, the agents in question, may return to the simple yet daunting task of winning basketball games in the Western Conference. There’s no guarantee that the Thunder make it to the playoffs, just as there’s no guarantee that coffee you bought at the store today won’t be on sale tomorrow. That would make you feel like it was a waste, but hey, you have the coffee now. And man, does it make you feel great.